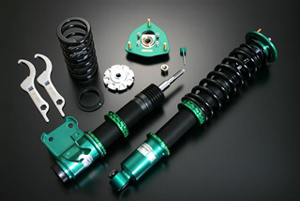 TEIN's support of competition D1 drivers and vehicles has led to the development of Super Drift dampers. Which were specifically developed for the avid drifter. Spring rates and damping force characteristics were chosen to increase car control in a drift, and to aid in initiating a slide. Full length and 16 level damping force adjustment allow suspension tuning for drivers at all skill levels. Pillowball upper mounts with front camber adjustment plates are included*. EDFC compatible for quick and hassle free dampening force changes. Super Drift is the suspension of choice for all levels of drifters.